Wire-Free Connectivity in the 2018 Toyota Prius | Del Toyota Inc. In the 2018 Toyota Prius, you can ditch the wires completely. This popular compact hybrid is equipped with modern technology that allows you to stay connected without having to deal with pesky cords. Toyota has included their Entune infotainment system in the Prius. 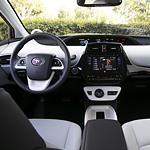 In the Prius Four and Four Touring models, you can get a premium 11.6-inch touchscreen. It uses intuitive multi-touch gestures that are easy to learn. You can connect your smartphone device to the system via BlueTooth technology. This allows you to enjoy your music, answer calls, and use voice recognition software without taking your eyes off the road. Also available is a wireless charging pad. It's compatible with devices that use Qi technology. Just place your device on the pad to refill the battery. Want to learn more about the technology in the 2018 Toyota Prius? We invite you to visit us at Del Toyota Inc. in Thorndale today for a test drive.